Hannah has resigned herself to a dead-end job and sealed her heart against love. One day she stumbles across a tiny cinema with one seat. As she watches the films of her life, she is forced to change her perspective and, ultimately, open her heart to love and happiness. Hattie has had a variety of jobs including junior assistant on Separates in Clements department store, a Berlin recording studio, hat-maker and a waitress. Apart from writing, she teaches meditation at a palliative care unit in Ladbroke Grove, and runs a cinema from a fisherman's shack in Whitstable. What is 17 + 6 ? Love this magical book,more please! Just a totally original book (a rare thing) that has charm, intrigue and wit- and is beautifully written;the style and language a mirror to the topic. funny and poignant. very enjoyable. What a lovely book! I took this on holiday with me and laughed out loud from my sun-lounger! Brilliant observations and quirky plot....I didn't leave the book behind because I wanted to lend it to my friends at home. Well done Hattie, I hope this is the first of many ....please give us some more. Beautifully written, touching story. I will happily recommend. Love this book! Poignant & funny. A fabulous, witty and moving read! I got the strangest looks on the tube...as I gaffawed and spluttered my way along the district line. Great fun with characters that stay with you. I loved this book, a real page turner! Perfect holiday reading! Hattie Holden Edmonds is a writer ahead of her time . There is fantastic humour in her stories which are full of acute observation and understanding of the human condition , Beautifully crafted and inspirational , we should all have one on our shelves. Such a great read, laugh out loud and seamless tearjerking,brilliant! Heartwarming and laugh out loud funny. Really enjoyed being with the characters. Magical book. I loved it. 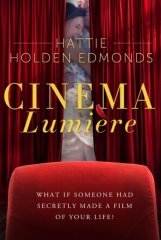 I loved Hattie Edmonds "Cinema Lumiere" and its positive message. Enlightening! ...love the twist at the end. I loved the fact that this book was quietly full of philosophical ideas and phrases that made me stop and think. Loved this book, it deserves to win.